Tucked away from Tokyo’s cloud-piercing high rises and gaudy neon signboards is the the Tsutaya T-Site in Daikanyama. Located in one of the city’s quieter neighborhoods, it’s a trendy hipster area that runs in stark contrast to the usual intense metropolitan hustle and bustle in the rest of Tokyo. And it’s home to one very good car meet. Unlike the impromptu meets at Daikoku Parking Area or Tatsumi Parking Area, the Daikanyama meets are more organized. It’s all set up by the Tsutaya T-Site bookshop and they’ve even got a Facebook page. Many of these meets have a special theme, you see. The page lets people know what the theme will be, how long it’ll run for, and if it’ll get cancelled. Google’s auto-translate will come in handy here. More often than not the slightest whiff of a rain cloud will be enough to cancel or postpone a meet. There have been a couple of times where they’ve held meets at Daikanyama during wet weather, but it’s not much fun as the turnout is bleak. When it is nice, there’s little to complain about. The meets held here are quite different from what most would expect from Japanese car culture. The morning cruise meets have been held here for a couple of years now, their 53rd meet was held last weekend with an Aston Martin theme. Daikanyama also has convenience on its side. Out of all the popular “meet spots” in and around Tokyo, Daikanyama it is the easiest to get to by far. You don’t even need a car. It’s a simple train ride and a 15 minute walk from Ebisu Station. Sure, Tatsumi and Daikoku are better representatives of the insane meets one would expect from Japan, but Daikanyama is worth a visit for a different reason. Almost everyone who drives their cars to Daikanyama are there to add to the theme or to appreciate the cars. They’re not really there to show off their latest toy—everyone sort of goes there to enjoy each other’s company. Most of the owners do know each other and there are also a few regulars. But almost every meet there’s new faces, and more recently an increasing number of foreigners are visiting the meets too. When a manufacturer supports a meet it’s usually to show off a new model or to sell some merchandise. The latest meet, with the Aston Martin theme, was a spur of the moment thing in response to the cancelled Zagato meet earlier this month. There was no merchandising opportunity and while they did display the new DB11, it didn’t seem like they set up this meet to sell it. Instead there were many Astons, including a few from the pre-Ford era too. Regardless of the theme of the meet, there’s always diversity at Daikanyama. Generally most of the cars will be the themed cars but there’s usually a section or two dedicated for the random cars that show up as everything is welcomed there. It’s particularly great if you like cars from the last century. You’ll be able to appreciate how well looked after they are, especially if they’re parked next to a modern car. You’d be hard pressed to see any difference in condition. That said, there have been a few modern cars at these meets too. Things like a Lexus LFA, KTM X-Bow, TVR Sagaris, Porsche GT3 RS 4.0, Aston Martin GT12 and Ferrari F12tdf have all been attention grabbers at Daikanyama, but it’s hard to escape the magnetism of the classics. More often than not you’re almost guaranteed to see a “unicorn” at Daikanyama. 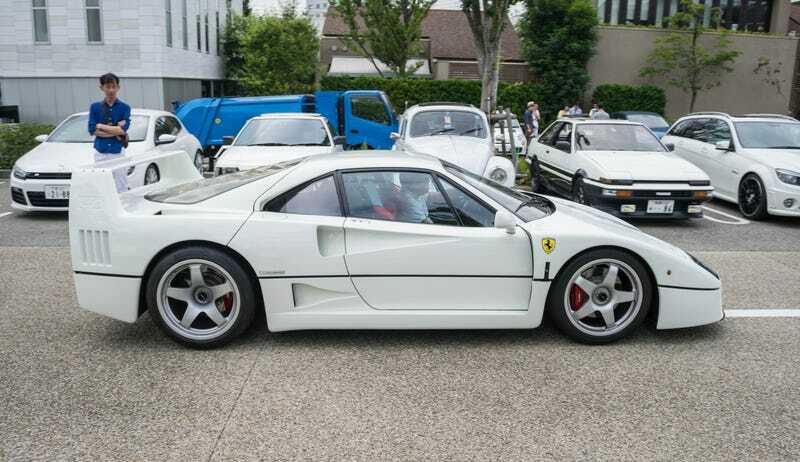 This was the first time I saw that white F40 that has since shown up to a couple of meets. The same goes for the red Lancia 037 Stradale. Hell, a BMW M5 E60 Touring showed up once as well. There’s been a few legendary Japanese cars at the meets such as the Toyota 2000GT, Mazda Cosmo, and Honda S800. Everything else from NSXs, RX-7s, Integra Type-Rs, and Skyline GT-Rs have been in the mix. Sometimes there’s even the odd American product too. The white F-150 SVT Lightning was a surprise and a rarity in Japan. There aren’t many pickups here, let alone one as crazy and ridiculous as the Lightning. That’s the car side of it. For the coffee well you’ll have to make do with the Starbucks located inside the book shop, but that’s not necessarily a bad thing as it gives you a chance to go inside. After the meets tend to wrap up at around 9 a.m. or 10 a.m., you can check out the great selection of motoring books and magazines at Tsutaya. They’re one of the few places I’ve been to that has some big-name international car magazines as well as all the domestic ones. It’s the collection of Japanese car magazines from the ’80s and ’90s that are the real treat though. They’re a ton of fun to read, and so is poring through the used car ads from that time. Regular morning cruises are held every second Sunday of the month, unless cancelled. Special themed cruises are held on the fourth Sunday. All information on themes and cancellations are posted on the Daikanyama Facebook page. You should check it out, and be social.